Tennis ace Caroline Wozniaki pounded the streets of New York today instead of walking up the aisle as she completed the city marathon in an impressive 3 hours 26 minutes. The Danish tennis star (24) was due to wed golf star Rory McIlroy in New York this weekend, but he ended the relationship after the couple had sent out their wedding invitations in May. Wozniacki ran in her first ever marathon in aid of Team For Kids, a charity that raises money for youth runners. She came home in three hours, 26 minutes and 33 seconds. Wozniacki wrote on Twitter: "OMG did I really just finish the @nycmarathon in 3 hours, 26 min and 33 sec??? Sooo happy and proud of myself!" 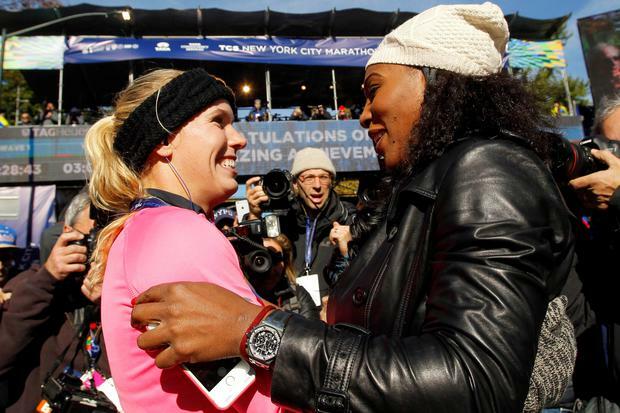 As she crossed the finished line the former world number one was greeted at the finishing line by friend Serena Williams, who beat her in the WTA Championships semi-finals in Singapore last week. In an Instagram video posted by Williams, Wozniacki said: "Oh my god, I thought I was going to die." Williams played a part in her final preparations too - the pair were photographed at the New York Rangers v Winnipeg Jets NHL clash on Saturday evening. Shortly before the race got under way, Wozniacki, who admitted in the run-up that she had suffered nightmares that she would be carted off in a wheelchair and that she had never run more than half of the 26.2-mile distance in training, tweeted: "Ready or not... Here I come, few min left!". Kenyans Wilson Kipsang and Mary Keitany were the winners of the men's and women's races respectively, with Keitany crossing the line in 2.25.07.